"The greatest victories come when people dare to be great...."
The winter sky had dark clouds that moved into the Shenandoah Valley late Thursday afternoon. Will they bring snow ... or ice? 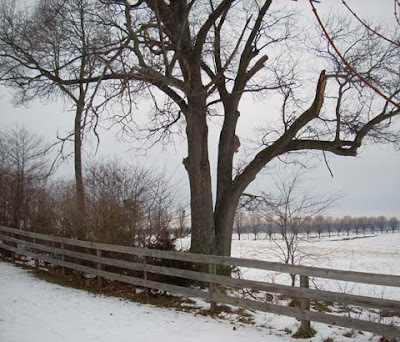 Tater and Max stand in their field awaiting the snow and ice. 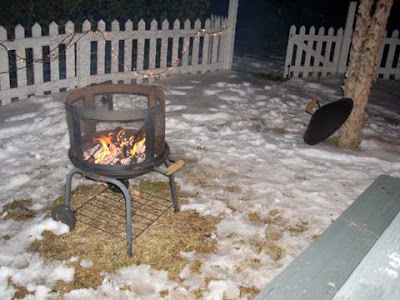 An old wives' tale says if snow stays on the ground two weeks it is waiting for more snow to join it. 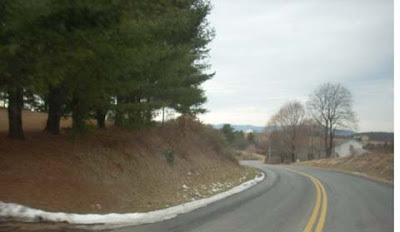 Here is snow along an Augusta County roadway two weeks after the last snow fall. The weather forecaster is calling for a wintry mix to move into the Shenandoah Valley tonight ... possibly snow, ice, or freezing rain. It sounds as if it whatever we get will not last long because the temps will rise over the weekend. Late this afternoon dark clouds moved in from the west over the Alleghany Mountains, the wind picked up, and the temperature dropped noticeably. We will see what Old Man Winter has in store for us. SWAC Niece lost her beloved hamster, Elf, today. He was a Christmas present two years ago (therefore, named for the movie "Elf" starring Will Farrell), and he had lived longer than expected. 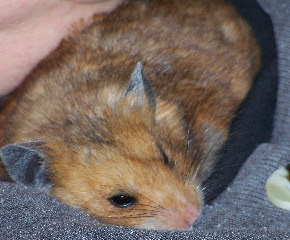 Apparently, a hamster has about a two-year life span, a fact we noted this past Christmas while Elf basked in the limelight as he slept on our laps or nuzzled around our necks. SWAC Niece is "the keeper of animals" and Elf was one of a number of critters she has adopted and cared for over the years. She's had cats, turtles, a snail, a hamster ... I cannot remember them all. She is our science-oriented girl who has been like this since she was two years old. It is a sad day for SWAC Niece -- the death of a pet is hard for young children -- so I wanted her to know that Elf was a good hammie and we all enjoyed him. She was his caretaker and took her responsibility seriously, keeping his cage clean, changing his water, feeding him on a regular basis, and showing him love. We will all miss him. Monday night found former Virginia Governor Jim Gilmore addressing over 100 people as the guest of the James Madison University College Republicans in Harrisonburg. Tuesday found him in the SWAC area where he met with Waynesboro News Virginian reporter Bob Stuart to discuss his campaign for U.S. Senate at the local Starbucks. Governor Gilmore is traveling the state visiting with folks to discover the issues they are concerned about ... and those include the economy, energy, and Iraq. It came in the mail Wednesday ... the annual New Year's card from Delegate Chris Saxman and his family. 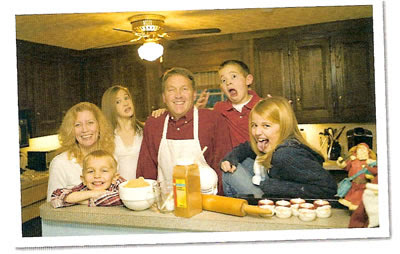 The front of the card features a great photo of the family in the kitchen of their home, all smiling for the camera as they are gathered behind the counter with what looks to be freshly baked cinnamon buns in front of them. Chris is wearing a cook's apron -- yes, he loves to cook -- as he holds youngest child John. His wife Michele, son William, and daughters Mary Kathryn and Nora, flank Chris. The front of the card says, "2008 ... The Saxman Family." Wishing your family a healthy and prosperous New Year. From our kitchen table to yours." Flip the card over ... and we see the real Saxman family! The cinnamon buns are still dough in a bowl waiting to be made with a container of cinnamon beside it ... various kitchen utensils including a rolling pin, measuring cup and spoons are on the counter ... Chris and Michele are still all smiles. The kids are what make this photo unique as the three older ones make funny faces at the camera. I've seen those faces before! It is hilarious and it is the Saxman family. I look forward each year to the Saxmans' card because it is always unique. Here's wishing them a Happy New Year and many thanks for Chris' representation as my delegate in the House of Representatives in Richmond. Marines attacked in Berkeley, CA ... called "unwelcome intruders"
The Berkeley City Council voted to condemn the Marines on Tuesday night, January 29, 2008, as part of a campaign by anti-war activists to shut down a U.S. Marine Recruiting Center located in the city of Berkeley. The votes by the Berkeley City Council were immediately condemned by Move America Forward, the nation’s largest grassroots pro-troop organization. 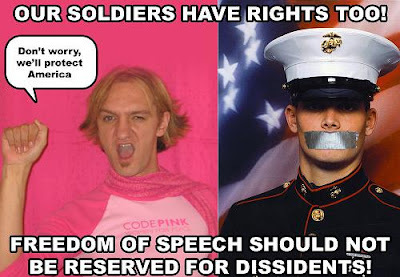 “It is disgraceful that in the birthplace of the Free Speech Movement, anti-military activists would attempt to silence the same military men and women who serve this country and give their lives to protect the free speech rights of all Americans, including these ungrateful and despicable people on the Berkeley City Council,” said Melanie Morgan, Chairman of Move America Forward. One of the two resolutions passed by the Berkeley City Council last night granted a parking spot in front of the Marine Recruiting Center to be used by anti-military activists to harass Marine recruiters. The anti-military activists would not need to apply for a sound permit for the next six months – allowing them free reign to disrupt the day-to-day operations by the Marines. Move America Forward organized a counter-protest in support of the Marines last October that attracted over 400 pro-troop supporters who stood in solidarity of the Marine Recruiting Center. “We have hundreds of thousands of military men and women serving honorably overseas to protect our freedoms. Imagine how they feel when they go to turn on the news and see that they are being stabbed in the back by shameful people here at home, it’s disgraceful!” said Catherine Moy, Executive Director of Move America Forward. Many of America’s most decorated war heroes from Iraq and Afghanistan have packed their bags and are hitting the road on a national bus tour to take their non-partisan message of progress and freedom from coast-to-coast. The Vets for Freedom National Heroes Tour is about supporting our troops, honoring their commitment, and rallying the country to complete the missions in Iraq and Afghanistan. At this critical juncture in our country, we need Americans, lawmakers and the media, to fully recognize—and appreciate—the sacrifice of our brave military and the dramatic success they have achieved, especially in Iraq with the new counterinsurgency strategy. The tour will roll into Richmond, Virginia, on Monday, April 7. Come out, meet some American heroes, and SUPPORT OUR TROOPS! Check the website in the upcoming weeks for more details. It came in the mail today ... the annual New Year's card from Delegate Chris Saxman and his family. “I was very disappointed to hear that Congressman Davis will not seek re-election this November. There is no smarter, hard working or dedicated member of Congress than Tom Davis. I know that Tom has enjoyed his public service a great deal, and I know this was a difficult decision for him and his family. I wish them all the best. “Congressman Davis served the people of Virginia with distinction for many years. As a member of the United States Congress, Tom has worked to find solutions to the challenges we face as a state and a nation. He has made a significant difference in improving the quality of life for his constituents in Northern Virginia. His service will be missed, and his shoes will be hard to fill. I was with the crew in Richmond last year for Bloggers Day and we had a fantastic time as we mingled with our fellow bloggers. This year, however, I had a conflict that prevented me from riding over with fellow SWAC blogger Chris Green for the second annual meet-up with others in the Virginia political blogosphere. Word from Chris tonight is that they are having a great time and they are now at dinner which is, once again, at Peking Restaurant where we all took part in a wonderful family-style Chinese dinner at last year's event, hosted by the Bollings. I'm sure we will have lots of great reports tomorrow from those in attendance. Thanks to Lt. Governor Bill Bolling for recognizing the new media which is very much grassroots-oriented. Here's hoping he will hold this event again next year. AG McDonnell: "Today, my good friend Congressman Tom Davis announced he will not seek re-election..."
“Today, my good friend Congressman Tom Davis announced he will not seek re-election this fall. I am saddened by this decision. The citizens of the 11th District, and all of Virginia, are losing a tireless advocate in the halls of Congress. After more than two decades of public service, I know this was a very difficult decision for Tom to make. “Tom Davis was one of the most effective members of Congress we have ever sent to Washington. Since first being elected in 1994, Tom Davis has been a stalwart defender and promoter of the people of the 11th Congressional District. He represented the citizens of his district with distinction. He worked tirelessly on the Wilson Bridge project, and other transportation priorities in the district. He led the fight to close Lorton Prison and redevelop the area. He played a leading role in attracting new businesses and high-tech interests to Northern Virginia, thus contributing greatly to Virginia’s 21st Century reputation as “The Silicon Dominion.” And Tom was appreciated for his statewide travels to advocate the principles of good and effective government. “Tom earned a national reputation in Washington as one of the smartest, and most innovative, members of the House of Representatives. He constantly sought new ways to reduce federal spending, and to eliminate outdated and unnecessary programs. As Chairman of the House Government Reform Committee, Tom demanded fiscal responsibility and accountability from the federal government. Tom also emerged as a critical voice on homeland security issues, leading on an issue of immediate importance to all the residents of Northern Virginia. As one of the shrinking number of veterans serving in the United States Congress, Tom brought crucial insights to the efforts to keep our nation safe and secure. “I commend Tom for a career of exceptional achievement. His uncanny political knowledge, his terrific love of Virginia, and his sense of humor are admired by all. He has served the citizens of Virginia well. I count Tom Davis as a personal friend, and as a great friend of democracy. I wish Tom the very best, and I know he will continue to play a leading role in the life of our Commonwealth and our country. I sincerely hope Tom Davis’s departure from public service is only temporary. Josh Levy is a law student at the University of Virginia ... a conservative young man, husband, father ... who cares out our country and our troops. When liberal anti-war protester Cindy Sheehan was in Charlottesville to hold an anti-war rally last June, Josh organized 150 "Win the War" supporters who showed up to show there were Americans who were not ready to give up on Iraq and Afghanistan. Josh has an article in the current C-ville Newspaper suggesting the Man of the Decade should be General David Petraeus because of the success he has had in Iraq. With fewer stories about Iraq in the media, many Americans are not aware of the great improvements there. Al Qaeda no longer has substantial control of any area of Iraq, normal citizens—Shiite and Sunni—have united to form over 300 neighborhood security groups, the Iraqi Army is increasingly conducting anti-terrorist operations on its own, and violence has dropped to two-thirds of what it was a year before. Not long ago, it seemed as if we were on the verge of defeat; now it is likely that Iraqis and Americans together will subdue al Qaeda and other radicals in Iraq and build a peaceful and tolerant society. The Fixer: Under Gen. Petraeus’ (left) watch, more Iraqis have begun cooperating with the U.S., and former enemies are switching over to our side. Homeschool Participation in Interscholastic Sports: HB 375 (Delegate Carrico) would require the governing body of interscholastic activities for public schools to develop and implement an exception to its rules addressing enrollment and eligibility of nonpublic school students. After an unusual turn, the bill was returned to Delegate Fralin's subcommittee to be discussed again on January 21. It did not pass the committee, but because of a strategic move by Delegate Cole, it was brought back up for discussion at the next subcommittee meeting with enough votes to pass. However, because it was not listed on the docket, it was moved that the bill be "passed by" for the day. It will be heard on Wednesday, January 30. Home Instruction Statute Changes: HB 767 (Delegate Tata), suggested by the Virginia DOE in consultation with HEAV, VaHomeschoolers, and HSLDA, initiated two changes in the homeschool statute. The changes simplify the homeschool statute and increase the filing options for homeschoolers. HB 767 passed the full House 82-17. It must now pass the Senate and be signed by the Governor in order to become law. Driver Education under DMV: HB 1540 (Delegate Hugo) moves driver education from the Department of Education to the DMV and repeals the homeschool driver education statute in the process. HEAV and HSLDA have been in communication with Delegate Hugo. We have requested that he include language that protects homeschool driver education laws such as the use of a correspondence course for the classroom portion of driver education and the allowance for parent-taught behind-the-wheel instruction. Delegate Hugo is agreeable and indicated he did not want to harm homeschoolers. The bill will be heard in committee this week. Homeschool Testing Options: HB 1183 (Delegate Lingamfelter) was accepted by the Education subcommittee in a substitute version. The language had been amended at the request of HEAV, VaHomeschoolers, and HSLDA. Delegate Lingamfelter noted: "This is a bill that will take some of the pressure off of the superintendent by giving homeschoolers more options in evaluating homeschool progress. Virginia is one of the stingiest states in giving only one clear-cut type of assessment. This bill gives homeschool families options for assessment." All present voted to report HB 1183 except for Delegate Ebbin. It will now be heard in the full Education Committee. The House of Delegates will debate a bill this week that provides a tax credit to businesses and individuals who donate to scholarship programs. HB 1164 passed out of a House committee on Monday by a vote of 13-7. The bill, patroned by Delegate Chris Saxman (R-20, Staunton), would provide better education opportunities for many Virginia students by allowing for scholarship funds with money donated by businesses and individuals receiving a tax credit for such donations. Many private scholarship programs annually turn kids away simply because there are always far more applicants than can be accommodated. This bill will encourage more donations to these important programs. Because a majority of the Virginia General Assembly is controlled by the Virginia Education Association, the Virginia School Boards Association, and the Virginia PTA, legislation that provides any financial assistance for families who choose non-public schools has never been successful. Those groups are vehimantly opposed to parental choice in education. While Delegate Saxman's bill does not provide a direct tax credit to families, it does allow for the creation of scholorship funds and promote donations to those funds through tax credits. Such programs will provide scholarships to students to be able to attend non-public schools. A tuition tax credit bill sponsored by Delegate Bob Marshall (R-13, Manassas) died in a House sub-committee late last week. Please contact your Delegate and urge them to support HB 1164. Gov. Warner unsure of where he sent VA Nat'l Guard? This story hits close to home for those of us who live here in the home of the "Stonewall Brigade" ... the 116th Infantry that is currently deployed to Iraq and heading home in February. "In 2004, I was activated with 500 other Virginia National Guardsmen to deploy as part of the global war on terror. Around Christmastime, we received a letter from then-Governor Warner noting the difficulties in being away from our families and thanking us for our service in Iraq. "One problem: We were serving in Afghanistan. "Should a 'responsible plan' ever come into existence, I hope for the sake of my brothers and sisters in arms currently deployed that someone with a significantly less anemic attention to detail than our would-be senator is in charge of the travel arrangements." First Lady Laura Bush and daughters Jenna and Barbara were together for this historical event, watching the President -- husband and dad -- deliver the SOTU address one last time. Secretary of State Condeleeza Rice was on the front row. Her leadership skills have been attacked by the libs but she is smart, articulate, and has proven to be a loyal member of the President's cabinet. "Loyal" in politics is rare; in D.C. it's practically unheard of. I saw 6th District Congressman Bob Goodlatte as well as Senator John Warner ... and I think I spied 7th District Congressman Eric Cantor. Other familiar faces were seen throughout the crowd. On the Dem side of the aisle it was interesting to see presidential candidate Barack Obama seated near the front with Senator Ted Kennedy who had endorsed Obama earlier in the day. They were laughing and talking with one another before the President's arrival. Meanwhile, toward the back of the crowd was Senator Hillary Clinton who had been knifed in the back earlier in the day by the Kennedy Clan. The Kennedys' timing was impeccable: they were able to steal some of the President's thunder as he prepared to address the nation and neutralize Hillary just in time to be on TV for the SOTU. She did not look happy ... the few times the camera went onto her she was not smiling. In my humble opinion, there is change in the air all right in the Democrat Party. Yesterday's snub by the Kennedys to the Clintons, you can bet, was intentional and well planned. Bill Clinton, who should have stayed retired, has tarnished his image as a well-liked president. Hillary's years of demanding behavior seem to be catching up with her. What an interesting presidential election year. Where is George Allen when you need him? Did I just hear McCain say what he said? "If Mitt Romney understood anything he would know our dependence on foreign oil is a national security issue." What? John McCain is against drilling for oil in Alaska. What wool is he pulling over the eyes of the voters in Florida? President George W. Bush ... redefining the term "lame duck"
It is President George W. Bush's last year in office and he is now termed a "lame duck." But something tells me this President is going to redefine the term. After all, the Fox News documentary about him that was aired Sunday night was called "Fighting to the Finish." Last night's State of the Union Address was a continuation of this energetic man's leadership ... an optimistic outlook for America ... a humble regard for the men and women who have been asked to protect us from terrorism ... a realistic understanding of what could possibly be accomplished ... and a gratefulness for the faith he has held to guide him throughout his term as a wartime President. I like George W. Bush. I consider myself fortunate to have had the opportunity to meet this man on several occasions over the years including a visit to the Oval Office. He thanked me for my volunteer work. Me -- when he had the weight of the world on him as he worked to protect the American people from further terrorist attacks. He is fair, funny, and a leader. I like optimists who see America as the shining city on the hill. That is George W. Bush. Something tells me this man is not going to be a lame duck President in the usual sense of the term. The Virginia House of Delegates Agriculture, Chesapeake and Natural Resources Committee is scheduled to hear House Bill 1175, sponsored by Delegate Scott Lingamfelter (R-31), on Wednesday, January 30. This important pro-hunting bill will establish an "apprentice license" which will be available to novice hunters and provide them with increased opportunity to experience the Old Dominion's proud hunting heritage. This legislation will allow new hunters to try their hand at hunting prior to completing a hunter education course, as long as they are supervised by a licensed, adult hunter. HB 1175 is part of the Families Afield Initiative that is a cooperative effort between NRA, the National Wild Turkey Federation, U.S. Sportsmen's Alliance and National Shooting Sports Foundation. Please contact the members of the House Agriculture, Chesapeake, and Natural Resources Committee and urge them to support Virginia hunters by voting for HB1175. Today: Florida Republican Primary ... who will win? The polls are open in Florida as 57 delegates are at stake in today's winner-take-all Republican primary. In the final hours before voting began, Mitt Romney and John McCain accused each other of being liberals, with Romney attacking McCain's legislation curbing money in politics, his more forgiving view of illegal immigrants and his backing of an energy bill that Romney says would raise costs for consumers. Although the City of Staunton recently adopted such an ordinance, the county has not yet done so. As a result, the owner of After Hours Adult Video store on Springhill Road was quoted in the Staunton News Leader as stating the he would open a similar business in Augusta County and perhaps other locations in the Valley as well. Numerous studies show that crime increases and property values decline wherever these businesses locate. Therefore, unless the Planning Commission and the County Board of Supervisors approve such an ordinance quickly, Augusta County residents are at risk for having an adult business near their homes, churches, schools, libraries, public parks – or nearly anywhere else that is not clearly regulated. 1. Contact members of the County Board of Supervisors for their support. 2. Attend the public meeting of the Planning Commission at the Government Center in Verona, which begins at 5:30 p.m. today. If you need further information, please email. From the North: Harrisonburg, Winchester & Washington D.C.
From Harrisonburg and all points North, on Interstate 81, take Exit 227, Verona. Merge right onto Laurel Hill Road (Route 612). At the second traffic light, turn left onto Lee Highway (Route 11). At the next traffic light, turn left into the Government Center complex. 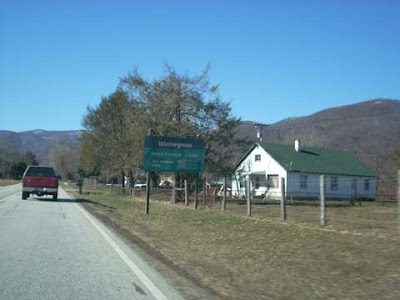 From Staunton, Waynesboro, and all points South, on Interstate 81, take Exit 225, Woodrow Wilson Parkway. 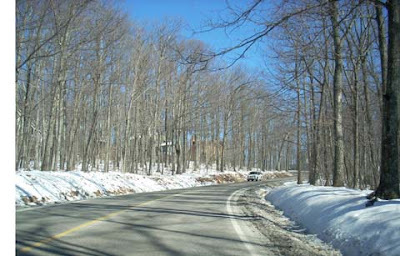 Turn left onto Woodrow Wilson Parkway (Route 275). At the first traffic light, turn right onto Lee Highway (Route 11). At the second light, turn right into the Government Center complex. Follow signs to "Public Meeting Room." The 2008 State of the Union Policy Initiatives book including all of the State of the Union fact sheets is now available on the White House website in PDF format. IRAQ: Continued Progress In Iraq Allows "Return On Success"
Watch tonight at 9:00 on Fox News Channel. President George W. Bush will deliver his State of the Union address on Monday, January 28, 2008, at 9:00 p.m.
"On Monday night, I will address the American people about the state of our union. I will report that over the last seven years, we've made great progress on important issues at home and abroad. I will also report that we have unfinished business before us, and we must work together to get it done. ... I am confident that we can work together to meet our responsibilities in these areas -- and leave our children a stronger and more prosperous America." Tune in to hear the President's last State of the Union Address tonight at 9:00 on Fox News Channel. George W. Bush: "Fighting to the Finish"
President George W. Bush is my hero. This Fox News documentary is a keeper, one to tape and watch in years to come, of a President who is down-to-earth, caring, sincere, humorous with a dry wit, and who has continued to lead under the crushing pressure of Bush-hating liberals who have never let up or listened with an unbiased ear during the seven years of his Presidency. Now he is in the final year of his Presidency and many, like myself, are grateful to this wartime President who, after having our country attacked seven months into his term on 9/11/01, has kept us safe from the terrorism that has affected the rest of the world. Fox News' Bret Baier (wasn't he affectionately called the "Chad Lad" in Florida during the 2000 after-election debacle?) spent an unprecedented amount of time with the President on Air Force One, at his Texas office, and being driven around the ranch by the President. FOX News' Bret Baier was granted unprecedented access by George W. Bush as the president begins the final year of his extraordinarily consequential tenure. This historic documentary — shot in high definition — takes you inside the Oval Office, to the president's Texas ranch, aboard Air Force One and into his private sanctums in the White House residence. In a series of no-holds-barred interviews, the president talks openly of his aim to consolidate his mark on history, his "Freedom Agenda," the failure to catch Usama bin Laden, the role faith has played in his presidency and how he was inspired by the writings and deeds of Abraham Lincoln. It's an unflinching, fair and balanced look at the nation's 43rd president — only on FOX News Channel. My family will be watching this special about President George W. Bush ... a man we all admire and respect. The 116th Infantry Brigade -- the "Stonewall Brigade" based in the Staunton Armory -- is coming home early from Iraq. They deployed last May and hundreds turned out to see them off. They are scheduled to return to Mississippi in February, and a tentative welcome-home ceremony is planned at the Armory on February 23. Mark your calendars to come out and welcome them home. The Staunton Armory is located on Thornrose Avenue beside Gypsy Hill Park. More information will be available as it is received. Mitt Romney ... "defending the American dream"
From my seat at the "Defending the American Dream" evening session, I could see Governor Mitt Romney standing in the wings waiting his turn to speak. He looked Presidential ... ramrod straight posture and chiseled good looks as he attentively listened to the lead-in speakers. I know ... that sounds shallow and, no, I do not choose my candidates on looks. What was impressive was that he delivered when he stepped to the podium. He was dynamic and received an enthusiastic reception from the crowd especially many of the College Republicans who were cheering and wearing "Mitt" lapel stickers. Governor Romney said he believed in the principles of conservatism and strength ... that a strong America is the best chance of peace in the world ... that America's strength stops wars. He stressed that Iranian President (terrorist) Mahmoud Ahmadinejad should not have been invited to New York ... he should have been indicted in New York. He received a hearty laugh from the crowd when he called the three democrat presidential front-runners the "Three Taxateers" ... and then proceeded to list his stand on the issues: kill the death tax, keep the Bush tax cuts permanent, lower the marginal tax rates, hold the line on Social Security taxes, and lower corporate tax rates because that will grow more jobs and more revenue. He said Americans should not be penalized on saving accounts and proposed those with incomes of $200,000 or less should pay no taxes on those savings. Mitt Romney is the only Presidential candidate to sign Grover Norquist's "Americans for Tax Reform" pledge. He believes in lower spending and Presidential line-item veto power, something he said he has used often as Governor. It is time, he said, for Republicans to start acting like Republicans. He ended by recalling a sad journey, as governor of Massachusetts, to the airport to pay respects to a Marine killed in Iraq. Standing on the tarmac, as the coffin came down the conveyor off the plane, he said his eyes filled with tears and he instinctively placed his hand over his heart in reverence and gratitude ... and as the coffin was carried off the plane, he turned toward the airport terminal ... and there, across the entire length of the building, lined shoulder-to-shoulder in front of the windows, were fellow Americans standing with their hands over their hearts in respect for this young Marine who had paid the ultimate sacrifice for our freedom. Mitt impressed me and afterwards I talked with his Virginia volunteer to find information for further research. I must admit I was impressed with Mitt Romney in 2002 in his role with the Olympics. Scandal-driven and in financial trouble ... and in the aftermath of 9/11 when terrorism was still very fresh on people's minds ... Romney became the head of the Salt Lake Olympic Committee and turned it around. Not only was he able to provide security that convinced people still skiddish from 9/11 to come to America and be a part of the crowds, he was also able to provide enough security to allow the President of the United States, George W. Bush, to attend the events. It's a moment I remember well because I was concerned for the President's safety ... our President in the stands with the crowd all around. Because of his leadership, Mitt Romney provided a safe and successful Olympics in the United States. I have heard many question Romney's religion. I don't give a whit about his Morman background (I'm Baptist) ... people in the 1960s were concerned that John F. Kennedy was Catholic and it did not affect him as President. I'm not going to church with the man; I want him to lead the country. Mitt is definitely on the short list of possibilities. He hit a home run Friday night and I'm listening. In tonight’s debate, Governor Romney again showed voters why he is the only full-spectrum conservative Republican who can bring together the Reagan coalition of economic, social and foreign policy conservatives to bring real change to Washington. Please take a minute to visit our Debate Central page where you can view highlights and commentary on the debate. While the polls show a close race in Florida, Governor Romney clearly has the momentum in this campaign and is poised for a strong showing on Tuesday. However, to guarantee the campaign’s success in Florida, we need the help of our Virginia volunteers today. Below is information on our innovative “Call At Home” program, which allows you to call targeted Florida Republicans and encourage them to vote for Governor Romney on Tuesday – all from the comfort of your own home. Through this program, hundreds of Virginians have made thousands of calls in NH, MI and NV to help GOTV for Governor Romney. Now, we need your help Friday-Monday to help make calls into Florida. Governor Romney has the momentum nationally and in Florida, but it extends to our campaign here in Virginia. Today, Morton Blackwell, the Virginia Republican National Committeeman and President of the conservative Leadership Institute, announced his endorsement of Governor Romney. Mr. Blackwell is an iconic conservative leader both nationally and in Virginia. He has been a leader in the conservative movement for more than four decades and we are truly honored to have him a part of our Virginia Team. Friends, each day, with the help of volunteers and supporters like you, Governor Romney gets closer to securing our party’s nomination and winning the White House. However, we need your help with the “Call At Home” program and to continue to recruit new supporters and volunteers to the Virginia Team Romney. I will be in touch in the coming days with more ways you can help in Virginia. Thank you again for all of your support. Staunton, under the leadership of Councilman Dickie Bell, took the fight for city zoning ordinances to Council and passed those ordinances in November to restrict the location of another adult business store after the opening of After Hours Video on Springhill Road in September 2007. Background on this issue is here, here, here, here, here, here, and here. A request was taken to the Augusta County Board of Supevisors asking that zoning ordinances be put into place in the county to restrict where adult business could locate ... and county residents are still waiting. Ordinances, drawn up by the Supervisors, were sent to the Planning Commission in December and that is where they are now. The owner of After Hours Video said Thursday he is considering opening a second adult business in Staunton, and also said he’s in negotiations to bring in another high-profile attorney to represent an employee indicted earlier this week on obscenity charges. “I’m not going to fold up my tent and go away,” said Rick Krial, owner of After Hours Video on Springhill Road. The Augusta County Planning Commission needs to speed up the process. They have been dealing with this issue since last year and Augusta County still has no zoning ordinances. The Planning Commission will meet Tuesday, January 29, at 5:30 p.m. at the Augusta Government Center in Verona. It is open to the public. Call your supervisor now if you do not want an adult business located near your neighborhood, church, playground, school, or other family-oriented location. They need to hear from the community. The Second Amendment was not written for hunters, or target shooters. It was written for responsible people to protect their country, their community, their family, and themselves. It was written so free people can remain free. Everyone knows Patrick Henry’s famous line, "Is life so dear or peace so sweet as to be purchased at the price of chains and slavery?...I know not what course others may take, but as for me, give me liberty or give me death!" What is less known, and maybe more importantly, he stated, "Guard with jealous attention the public liberty. Suspect everyone who approaches that jewel." That was part of a column written by Phil Lynch at Yankee Phil in the November 27, 2007, Staunton News Leader. John Snyder, the Public Affairs Director for the Citizens Committee for the Right to Keep and Bear Arms, saw the column in the online edition of the NL and nominated Phil for their monthly award. Phil won the group's January "Defender of the Month" award and, as a former police officer, he definitely deserves it. Our congratulations to Phil. See photo at Yankee Philip. Matthew DeLeon, who blogged at The Young Reaganite, has now helped organize and is writing at the George Mason University College Republican blog. Hey guys, i want to thank all of for reading and keeping up with the Young Reaganite. As of late I have started writing for the George Mason College Republican Blog. I am the creator and lead blogger of that blog as well. Because of that, I am going to stop writing on this blog for the time being and focus my efforts into the GMU College Republican Blog. The goals of that blog are the same as this one, the dedication to freedom and conservatism. I hope you cane enjoy the GMUCR blog like you enjoy the Young Reaganite. If you get a chance drop by to check out what's going on at the GMU blog and support our young Republicans who are the future of our Party. You may also want to check out the College Republican Federation of Virginia Blog. Thanks to all our CRs for the hard work they do to advance the principles of the Republican Party. The Jim Gilmore for Senate campaign announced today that John Van Hoy has endorsed Jim Gilmore and will serve as his Stafford County Campaign Chairman. Fredericksburg Businessman John Van Hoy has joined the Jim Gilmore for Senate Campaign and will serve as the Jim Gilmore Senate Campaign Chairman for Stafford County. “John’s business savvy and well regarded values and community activism are key elements that will help our campaign on the road to victory in November,” said Gilmore in announcing Van Hoy’s addition to the Gilmore team. A long time member of the Republican State Central Committee and former Chairman of the Stafford County GOP, Van Hoy, a local businessman and geologist, has served on a variety of community boards at the state and local level, as well as business and trade association boards. “I am proud supporter of Governor Jim Gilmore’s candidacy for the United States Senate. As a U.S. Senator for Virginia, Jim Gilmore will carry forth his proven determination of reducing the size of government and the goal of keeping as much of working families’ hard earned money in their hands. We are taxed too heavily everywhere we turn and Jim Gilmore knows that. We know that whether we had a surplus or were in a recession, Mark Warner raised our taxes and if elected Senator will do so again." The endorsements continue to pile up as Jim Gilmore heads into the Republican Convention on May 31 to secure the nomination. If he is successful, he will run against Democrat Mark Warner. Richmond, VA -- House Republicans today defeated House Bill 852, an effort to wholly repeal the prohibition on collective bargaining by government employees. House Bill 852 – sponsored by Delegate Adam Ebbin (D-Arlington), former Virginia Department of Commerce and Labor Chief Deputy Commissioner under Governor Mark Warner – would have allowed state and local government employees to collectively bargain with a union. If approved, the bill would have marked a reversal of Virginia’s long-standing status as a Right to Work state. All House Republicans voted against this anti-business measure, citing it as detrimental to Virginia’s economy and likely to endanger the Commonwealth’s status as America’s best state for business. With emotions running high as some families of Virginia Tech massacre victims joined others in the packed room, the Senate Courts of Justice Committee voted down SB 109, the so-called gun show "loophole" bill, by a vote of 9-6. The bill proposed that the government have a hand in individuals who want to sell firearms. This has been written about extensively in the blogs. More info can be found at the Richmond Times-Dispatch. Delegate Chris Saxman (R-Staunton) introduced a bill that would prevent legislators, the governor, lieutenant governor, attorney general and members of the Virginia congressional delegation from attending Party-sponsored fundraisers during a regular General Assembly session. His concern was the influence such events could have over legislators. The bill overwhelmingly passed the House 95-1. It now goes to the Democrat-controlled Senate where it will likely face stiff opposition. Jim Gilmore continues to be for the little guy by reiterating his long-held view of controlled government spending and no more tax increases. "Lower taxes promote economic vitality. They help preserve strong incentives for growth and job creations. My record is solid and distinguished by a principled, determination to keep more of taxpayers' money in their own pockets. Unlike that of my opponent Mark Warner, whose legacy as governor is one of tax and spend and tax again," stated Gilmore. "Democrats, like Mark Warner have the wrong economic solutions. Raising taxes on already over taxed working families in order to pay for even bigger government is the wrong thing to do. We need to work towards preserving our dynamic economy and address both short term and long term solutions that are in the best interest of our families, our children and our future. A sustainable fiscal policy which includes controlled spending and permanent tax cuts to working families is the way to get our economy on the move again." A fiscal conservative, Jim Gilmore is the person we need to represent us in the U.S. Senate. 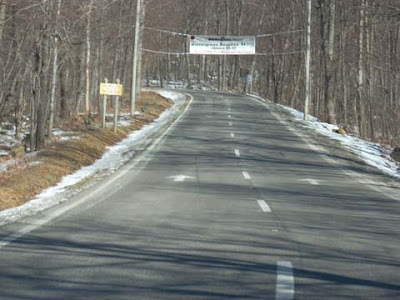 Banner welcomes Wounded Warriors at entrance to Wintergreen Ski Resort. 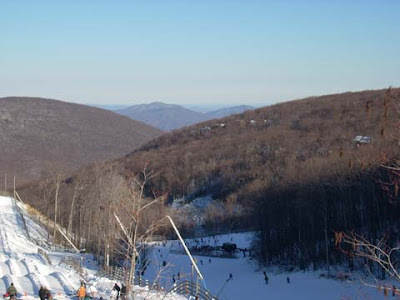 The Wounded Warrior Weekend sponsored for the fourth time this year at Wintergreen Ski Resort is a wonderful way to honor those veterans who have been permanently injured in the line of duty. 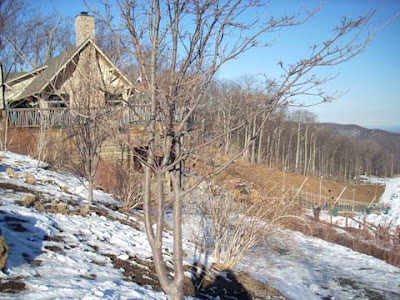 Held the last weekend in January, this year's event will take place January 25-27, 2008, as Wintergreen hosts disabled vets from every branch of the military. Ski instructors will spend the weekend teaching adaptive skiing techniques to help wounded vets adjust to their disabilities and fit into society. Tom Brown is the event's organizer and I spoke with him about Wintergreen's part in rehabilitating these veterans. 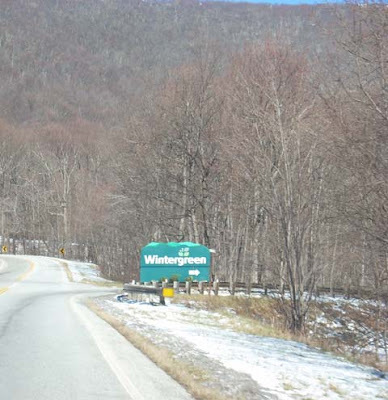 Working with Walter Reed and other veteran outlets, Wintergreen foots the bill for the entire weekend -- lodging, meals, lift tickets, ski lessons, reimbursement for travel for those who drive. "It's a tremendous confidence booster for them. Some of them have told me in the past that coming to an event like this helps them to get up and out and get back into life. And, sometimes that's just the little push that they need to take a step along their road to recovery." Many thanks to Wintergreen for what they are doing for these American heroes who sacrified to keep us safe from terrorism so that we may ski and enjoy life here at home. Rockingham County Del. Matt Lohr's bill placing greater regulation on abortion clinics was passed in the House of Delegates Tuesday. Lohr (R-Broadway) had the support of his fellow Shenandoah Valley delegates Todd Gilbert (R-Woodstock), Chris Saxman (R-Staunton), Steve Landes (R-Weyers Cave), and Ben Cline (R-Lexington). The bill, which passed by 60-37, calls for "state licensing of all abortion clinics, not including a hospital or an ambulatory surgery center, in which 25 or more first trimester abortions are performed in any 12-month period," according to the Harrisonburg Daily News Record. Now it faces the Senate where it is expected to face more opposition. Valley Senators Mark Obenshain and Emmett Hanger will be in on that vote. Billy Poole, 28, an up-and-coming star in the big-mountain ski community of those who push the limits, died yesterday after jumping a cliff in Utah, landing on the rocks below, causing fatal injuries. [Poole] recently told the Web site Big Lines about escaping an avalanche while in a helicopter last winter with other skiers and a film crew in British Columbia. "Not to be dramatic, but there is no reason we should have made it home at all that day. ... I now know that any one of my friends could be gone in an instant and it has made me very thankful for the time I have with them," Poole said. Congressman Bob Goodlatte (R-6th Congressional District) visited Waynesboro yesterday to applaud a successful business in the community. Clark Manufacturing on Hopeman Boulevard builds walk-in freezers and other related manufacturing items and will employ 60, producing $10 million in sales. Read the entire article by Bob Stuart at the Waynesboro News Virginian. Waynesboro Councilman and businessman Frank Lucente, 62, has announced he will run for reelection for the seat he was appointed to in 2006. The seat was won by Chuck Ricketts in 2004 but, when he was tapped two years later to be a judge in Waynesboro's Juvenile and Domestic Relations Court, Lucente was selected to replace him. He said a big thing he's learned is that a small number of people representing special interests can be influential in pursuing money for their interests, while he believes the average citizen sits quiet. An active community leader, Lucente has served on the boards of many civic groups. City Council elections will be held in May. C. Dickson, who blogs at Powhatan Life and is one of the United Conservatives of Virginia gang, lost her father today to illness. Our prayers and thoughts go out to her at this difficult time. We wish them safe travels as they join friends and family to celebrate the life of her dad. Delegate Chris Saxman's HB 328 proposing elections be moved from May to November is good for Staunton and Waynesboro. Kurt Michael has more at SixtyFour81.com. Spanky: "Is the Staunton News Leader desperate for readers?" It is a legitimate question ... "Is the Staunton News Leader desperate for readers?" In this reddest part of Virginia where most are conservative and 75% voted for George W. Bush in 2004, the NL continues to aggitate and push away readers, lose subscribers, and alienate advertisers. It does not make political sense. Now they have done it again by attacking Delegate Ben Cline, a very popular representative of voters in the 24th House District. This is not the first time the NL has attacked Del. Cline. They once said that instead of running for reelection he should stick to washing Congressman Bob Goodlatte's car. Del. Cline has done nothing to deserve such public attacks from this liberal newspaper other than the fact he is a Republican and well-liked by his constituents. Spank That Donkey has the complete story. This afternoon, Fred Thompson announced that he will no longer be a candidate for President of the United States. While I am very disappointed in this development, I understand the reality of the situation. With Florida on the horizon, followed by Super Tuesday, enormous resources would be necessary for the Thompson campaign to continue to compete. Absent those resources, the continuance of this campaign is just not feasible. Over the past few months I have gotten to know Fred Thompson well. He is an individual of impressive intellect, strong character, and a passion for freedom and ideas. I endorsed him, along with George Allen, because I believe he is a consistent conservative, with a positive vision for our future. He brought real substance to this race, taking a true, conservative approach to every issue, challenging the notion of big government, championing federalism and bringing the issue of social security and Medicaid reform to the forefront of the debate. Now, the Republican Party must find the best candidate to lead us forward in the general election. We need a candidate who believes in, and can clearly articulate, the conservative philosophy of strength abroad, freedom at home, and respect for life and liberty. Whoever can do that will have my full support. Fred Thompson's announcement was not unexpected but we still are sad he has withdrawn from the presidental race. We wish him well and agree with the Attorney General that the candidate who can clearly articular the conservative philosophy of strength abroad, freedom at home, and respect for life and liberty will receive our full support. and a Benediction from Above. And the birthday boy is ... Carl Kilo!! Today is Carl Kilo's birthday ... and he's Sparking It Up! Read the story of his birth on the same day as the anniversary of Roe vs. Wade and his adoption ... and you will understand his extreme appreciation for reaching the youthful age of 43. Bob Campbell has lived a full life. He sings with the Coachmen, is retired from DuPont, and works part-time as a substitute teacher in the Staunton public schools. He has lived in Staunton all his life ... and now he wants to give back. He announced his candidacy for City Council on Monday. Self-described as "a man of the people who feels that the city needs to be more responsible to the people it serves," he is ready to step to the plate and bring his fiscally conservative values to the city. Elections will be held in May. Breaking Update: Fed cuts key interest rate three-quarters of a percentage point. Investment types say this means the government understands the severity of the situation. I received an email from a friend this morning who is warning of a Black Tuesday in the financial markets. He has been investing for 25 years and knows the markets ... and his warning is to watch the opening bell today to see what happens. Yesterday's Asian markets fell even as Wall Street was closed for the Martin Luther King holiday. January 2008 is acting a lot like October 1987. Down every day, options expire on Friday, crash on Monday. We couldn't crash on Monday because of the holiday but come Tuesday morning, look out. As of 10:02 AM Monday morning the S&P will be down 47 points. This translates to the dow falling 350 to 400 points. The Bush PPT ( Plunge Protection Team) will be working overtime today. Looks like the S&P will trade today on Globex. Link here. Wall Street is facing what could be one of the ugliest trading days since Sept.11 after global markets went into a selling panic this week. Perhaps the worst will not happen. We shall know by the close of business today. Refill that popcorn ... this show continues to entertain. What is the role of former Presidents? There was a time when former Presidents were statesmen and held in high regard by Americans as they took a back seat after their time in the White House. They did not meddle with current Presidents and kept their opinions to themselves. Name a former Republican President who has criticized a sitting President. You cannot because it has not been done. Name a former Democrat President who has criticized a sitting President. Jimmy Carter immediately comes to mind. Jimmy Carter has been particularly out-spoken, calling President George W. Bush "the worst president in history." He has been critical of the war in Iraq, speaking out when he should have remained publicly silent. After all, his single term in office was nothing to gloat about. Now we have Bill Clinton on the campaign trail for his wife and, very often, not acting very presidential or gentlemanly. Would it have been better to remain behind the scenes and let people remember him from his glory days as President? He has now replaced those memories for many in what is becoming an increasingly bitter race between his wife and Barack Obama to gain the democrat nomination for President. Former presidents have always had an unwritten code of silence, a kind of gentleman's club of gentility and understanding of the heavy burden that falls on the shoulders of the leader of the free world. They have been there, done that and have a unique understanding that has prevented criticism in the past. Will the modern presidential code of silence hold up? Probably not. It's very likely that as former presidents live longer (given the overall trend toward longevity), they will be tempted to get into tangles with their successors as more and more differences of opinion pile up. If they see their images, legacies, or pet projects threatened, they are likely to defend themselves or go on the attack. Just like Jimmy Carter. I hope this conclusion is wrong. With only one year left in his presidency, we will soon see how George W. Bush will handle private life after the White House. Knowing his upbringing in the Bush family, my belief is he will conduct himself like a gentleman, just as his father has done. Too bad I can't say the same about Jimmy Carter. Grozet at the College Republican Federation of Virginia blog is a fellow FredHead and has some thoughts about Fred leaving the race especially now that he has pulled out of Thursday's debate in Florida. I will not boycott the Republican ticket by not voting so will now decide between those left in the race. McQ over at Q and O has my favorite version of last night's dem debate in South Carolina. It's succinct and humorous. 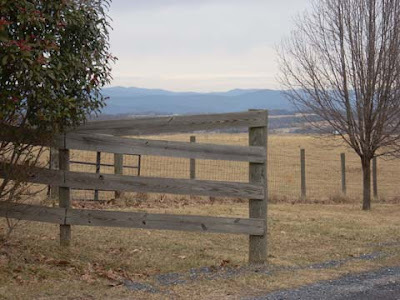 Wintergreen sits atop the Blue Ridge Mountains and straddles both Augusta and Nelson counties. 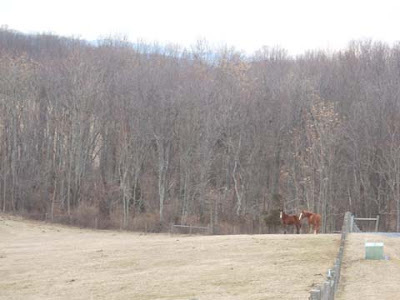 It is about a mile from the Blue Ridge Parkway and the "back" way over from Augusta County. The setting sun looking west from atop Wintergreen resort. 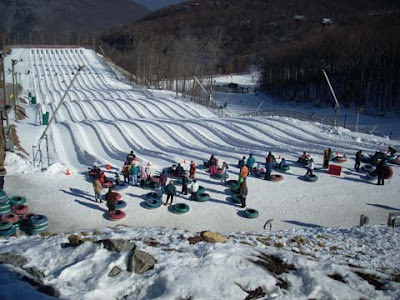 We took the Subaru up to Wintergreen this morning and spent the day snowtubing and enjoying winter. It was c-o-l-d with a high of probably 15 degrees ... the high at my house today was 25. Brrrr. Extra clothing was definitely a necessity but normal for winter weather at the ski areas. Snow was on the ground, the slopes were in great shape, and they were making snow all day to satisfy the capacity holiday crowd. 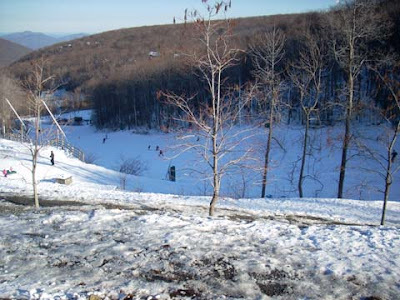 While Massanutten is located at the bottom of the mountain east of Harrisonburg, Wintergreen, south of Charlottesville, is on top of the world. 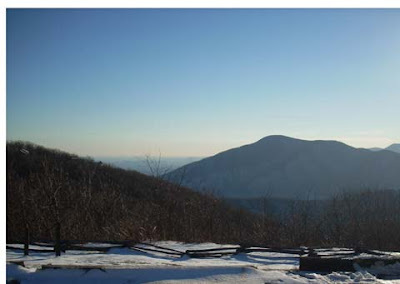 The views across the Blue Ridge were absolutely gorgeous ... photos do not do it justice. The crisp clear air made the mountains stand out sharply against the blue winter sky on a clear, cold, sunny day. 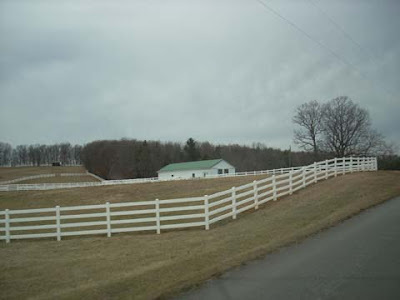 Driving back home, crossing over the Blue Ridge Parkway (which is closed due to ice and snow) and back into Augusta County, we took the back roads through Stuarts Draft heading to the western end of the county. 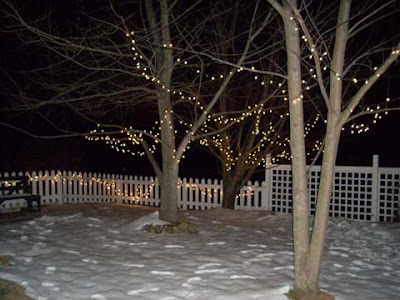 At our house we enjoy all seasons of the year and, since we do not receive that much snow in Virginia and only occasionally have extremely snowy winters, we take advantage of the winter events while we can. We have another winter advisory for tomorrow with the forecast predicting everything from freezing rain to sleet to snow. ... President Ronald Reagan's second inauguration was held in Washington, D.C. (January 21, 1985). President Reagan humbly thanked Americans for the title of "Great Communicator" but informed them that he was really communicating great ideas. He put America on a course to freedom that embraced great conservative ideas and made no apologies to the naysayers and pessimists. "Whatever else history may say about me when I'm gone, I hope it will record that I appealed to your best hopes, not your worst fears, to your confidence rather than your doubts. My dream is that you will travel the road ahead with liberty's lamp guiding your steps and opportunity's arm steadying your way." 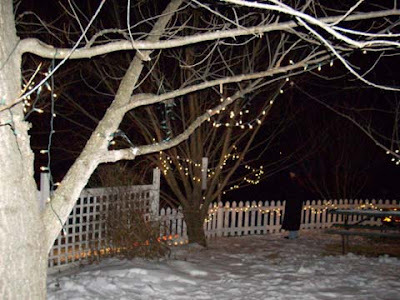 I went outside last night around midnight before turning off the snow lights ... spent about five minutes breathing in the cold 4-degree air and enjoying the quiet. There was a full moon which acted as a heavenly spotlight with a brightness that actually had the trees casting shadows across the frozen surface. It was beautiful and I would have liked to stay longer ... but five minutes was about as long as I could stand sitting huddled in the cold. The low overnight hit zero. Now that's cold! It was 7 degrees this morning with a high of 18 for the day. 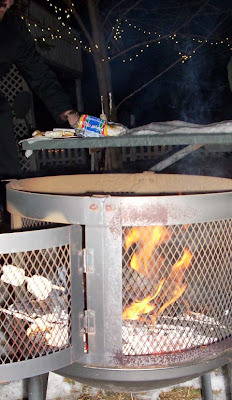 Tonight at 9:00 it was 8 degrees and dropping toward 0 ... brrrr. 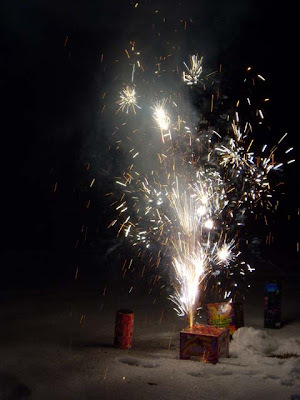 Last night's fireworks were fun in the snow and added a celebratory air to the evening. Drove out to Augusta Springs today and walked around in the 18-degree weather. It was an icy sunny day and as long as we were out of the wind it was not too bad. Sledding today was f-a-s-t on the frozen, crusted snow. Whoosh! 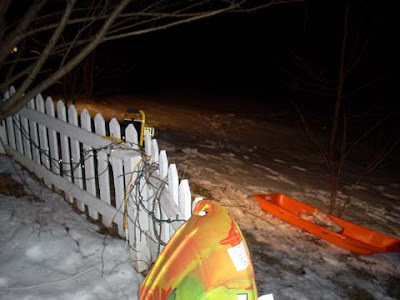 Too cold for much sledding tonight ... only the hardiest are braving it. Woodstove inside is blazing and the Green Bay football game is on as we roast hotdogs and marshmallows. Snow sledding in the Valley ... fun, fun, fun! Bob Goodlatte: "Holding the line on spending"
Grab a seat ... the show's getting good! We need to drill for oil in the U.S.
"Screw your friends and appease your enemies...."